I was in the second year of my bachelor's degree when my classmates had decided for this night trek. I barely knew what was trekking all about, this was my first trek no doubt I fell in love with it thereafter. Friday Night: We all assembled at majestic at 9 pm. Took Chikballapur bus at 10 pm, conductor dropped us near a small village at 12.30 am. We walked for the next 3 kms until the base of the hill. There was a temple at the base, we hired a local guy for showing us the route who charged us around 400 Rs. Night Trekking: The trekking was fun filled. There were some tricky paths on the route, I don't remember much from that night but all I know was it was awesome trekking experience I ever had. The hill top: Reached the peak around 3.30 am. there were many groups at the peak already. It was freezing cold. We had to put on the campfire to keep us hot and alive. 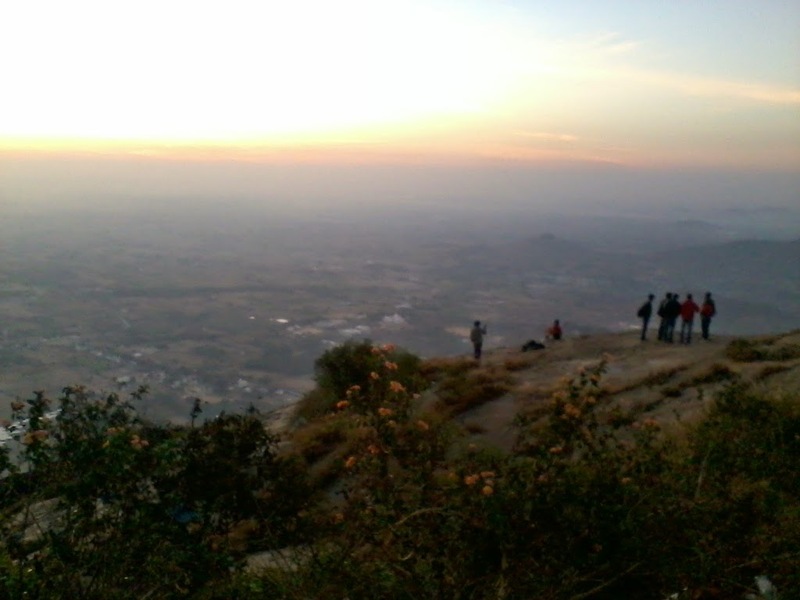 The sunrise: We were waiting eagerly since 3 am for the sunrise, I never had witnessed the sunrise before like this. Though we were all exited the cold was killing us. It was 6.30 am when the sky was filled with the light but sun was still lazy enough to get up. Trekking at Skandagiri is completely banned, night trekking was banned years ago but from more than 6 months even day trekking has been banned. Its not just another Rule are made to be broken kind of law, forest officers are very strict about this. Even if you try to trespass villagers would catch you in the morning and complain to Police. Any trespassing could lead to imprisonment for up to three months. Ray of hope: Dr. V R Naik, Deputy Conservator of Forests, said there is a proposal to resume day trekking but with a guide for every batch arranged by forest department themselves. Hopefully, Skandagiri will be opened up for the trekkers soon, I will update whenever I get any info till then don't even think of going trek at Skandagiri. I visited this place in Jan 2019. Read my experience This is why Trekking to Skandagiri is a bad idea.